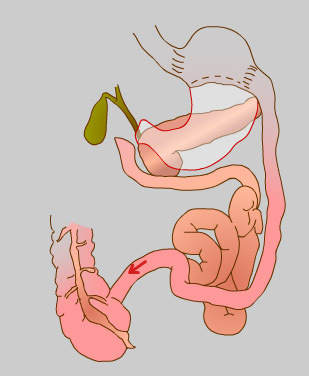 intestinal bypass which significantly reduces the absorption of fat. The capacity to eat is greater than with the other operations, and the eventual weight loss is the best of all the operations but if fatty foods are overeaten e.g. a hamburger and fries then diarrhoea and foul flatus will result. lifelong supplements of the fat soluble vitamins ( A D E K ) Calcium and sometimes Iron.